Marketers are paying top dollars to reach an audience segment that has been dubbed the “Digital Elite” by a new report from marketing solutions provider Turn. Turn’s Digital Audience Report, which highlights insights from the first quarter of 2013, calls the Digital Elite “the world’s most valuable audience” and claims that marketers are seeking out this audience because of their active online habits and spending behavior. In fact, the Digital Elite, which is only 2 percent of consumers on the ’Net, sees 24 times more ads than the average consumer – which puts them in such high demand that marketers are willing to pay an 85 percent higher eCPM (cost per thousand impressions) in order to reach them. So what does a member of the Digital Elite look like? According to the report, these Web surfers are typically aged 21-34, live in cities and love foreign travel. They also average an annual income of more than $76,000, as well as love gadgets and upscale brands. Moreover, the Digital Elite can frequently be found at bars and concerts, and have diverse media tastes – consuming a variety of content ranging from public radio and Family Guy to Elle and GQ. The report also reveals that 85 percent of the Digital Elite is located in the U.S., and that the average eCPM of this group is $1.15, which is 85 percent higher than the average of $0.62 that is paid for other audiences. Conversely, the report found that the audience group targeted least by marketers includes an inconsistent number of people who are retired or mothers of young children. This group typically makes less than $51,000 a year, are price-sensitive, save their money and are more likely to be devoted sports fans. It is also important to note that the report shed some light on ad format trends, revealing that marketers are paying more for display, video and other rich media ads, and less for mobile and social ads. In fact, global average video eCPM grew from $9.41 in January to $9.99 in March, while display eCPM increased from $0.92 to $1.06 in Q1. 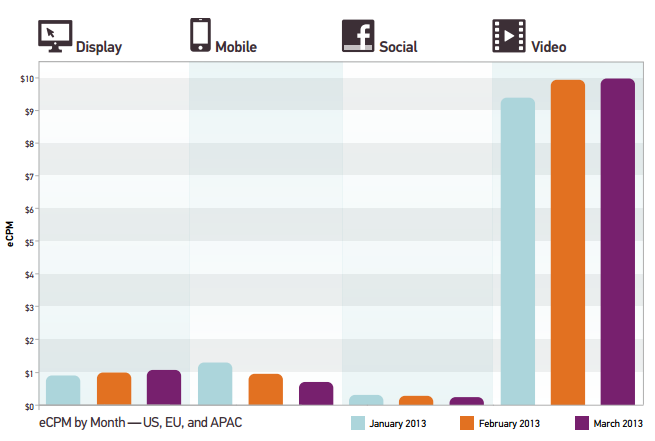 On the other hand, mobile ads remain inexpensive, with mobile eCPM dropping from $1.31 in January to $0.72 in March. The report claims this is most likely because an ecosystem for anonymous tracking isn’t in place for mobile yet. Furthermore, social advertising remains both low-cost and efficient for brands, with the eCPM for Facebook ads dropping from $0.30 in January to $0.24 in March.